This delicious baklava recipe was submitted to us by Farhood Zafari from iranchef. 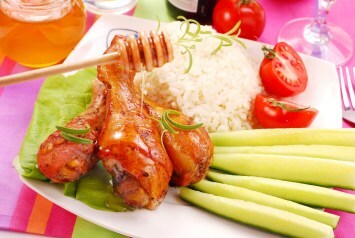 Farhood has submitted several really delicious recipes to the site. This one is for that Middle Eastern favorite dessert, sweet with honey, nuts and cinnamon. It is not difficult at all and I think you will really love it. 1. Lightly grease a 9"x13" pan and set the oven to 350°F. 2. Thaw the phyllo dough according to manufacturer's directions (this may take overnight). When thawed, roll out the dough and cut the dough in half so the sheets will fit in the pan. Cover the phyllo dough with a damp towel to keep it from drying out. 3. Process the nuts in a food processor or blender until they are in small, even sized pieces. Combine them the with sugar, cinnamon, and cloves. In a separate bowl, melt the butter in the microwave. 4. Place a sheet of phyllo dough into the pan. Using a pastry brush, brush the phyllo sheet with melted butter. Repeat 7 more times until it is 8 sheets thick, each sheet being "painted" with the butter. 5. Spoon on a thin layer of the nut mixture. Cover with two more sheets of phyllo, brushing each one with butter. Continue to repeat the nut mixture and two buttered sheets of phyllo until the nut mixture is all used up. The top layer should be 8 phyllo sheets thick, each sheet being individually buttered. Do not worry if the sheets crinkle up a bit, it will just add more texture. 6. 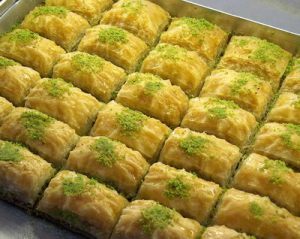 Before you bake the baklava, cut it into 24 equal sized squares using a sharp knife. Bake at 350°F for 30-35 minutes or until lightly golden brown, and the edges appear slightly crisp. 7. While baking, make the syrup. Combine the cinnamon stick, sugar, lemon juice, honey, and water in a saucepan. Bring to a boil, then reduce to medium low heat and let simmer for 7 minutes and slightly thickened. Remove the cinnamon stick and allow to cool. 8. Spoon the cooled syrup over the hot baklava and let cool for at least 4 hours. Garnish with some finely crushed pistachios of desired. This fabulous baklava recipe would be perfect after a meal that includes this light fennel, orange and olive salad.